When you think of a large tent, the standard frame tent is the first thing that comes to mind. It is the ultimate classic because it has been around since the 60's and to this day it is the most common frame tent available! If you ask just about any tent manufacturer for one of these, odds are they will have it. It has become the standard for what a tent is. All modern tents being developed are based off the standard frame tent. Its most prominent feature is the pyramid shape on the tent top. Another key feature is the use of the 2 inch aluminum poles. Once the tent is completely installed it has 8 legs to support the tent frame and top. It, like most modern frame tents, has a vinyl tent top that can either be white or any of our standard colors. One way to customize it is by adding branding through printing to the tent top to showcase a logo or your favorite graphics. You can also accessorize the tent with walls, flags, or even tent counters. The most popular size you will see this tent in is 20 feet by 20 feet, although it can be made to whatever size you need. Since we manufacture everything in house it can be made in many different sizes ranging anywhere from small sizes to extremely large sizes. On the small end we can technically build a 1x1 tent but it is not realistic/nor feasible. On the large end we can make the tent 80 feet wide by as long as you need! Yes, we can technically make it to be 10,000 feet long because we have developed a method that allows us to create a tent top that fits any size necessary. The High Peak builds on top of the design elements of the standard frame but the tent top has a peaking section that makes the tent look far more elegant than the standard tent. High peak tents are unique to other tent styles in that the peak is extra pointy and high. Hence the name, high peak. This pointy peak increases visibility, which can really help you stand out in a crowded space. Some would call these types of tents, carnival tents. Whatever name you’d like to give them, our high peak tents are durable, beautiful, and heavy duty. A unique feature that high peak tents offer is the fact that they are have arching valances (the lip of the tent), as opposed to rectangular valances found in most tent styles. Yet another unique feature this tent offers is the fact that it can be created with multiple peaks! That's right, it can have a double or even a triple peak (depending on the size.) Each of the tent peaks is usually adorned with a small flag. Overall, it looks much cleaner and elegant than the, now classic, design on the standard tent. The Dome frame tent is a very unique tent with a semi-circular frame structure. The tent offers a more private enclosure within the tent as opposed to other tents that are tend to be more wide and open. To make things even more private you can add walls to it. We had a marketing company contact us to create a couple of these dome tents for one of their clients. Beneath each tent they held small events, handed out brochures and even provided attendees with goody bags. The multiple dome tents were stationed across a designated area and they were pit stops for event goers to check out as they attended the event. These specific tents were 10x10 but should you need a bigger size we can definitely manufacture it. They can be created with awning systems too, like the ones showcased on the left. All in all, it is not a very common tent style and when people see it, it immediately catches their attention. Truss frame tents are relatively new in the grand scheme of things. Most other frame tents use a 2 inch aluminum poles for the legs but truss frames are made with extremely heavy duty structural designs. They offer support like no other. It is the structure system they use for concert venues to hang lights and screens and all sorts of other decorations. So what we did is we took that structure and applied it to our tents but with a truss support system. With it we have been able to create some pretty intricate designs with unique looks. Now, we only manufacture these upon special request because of how complex the tent system is compared to the previously mentioned tents. The two examples above are a large 30x30 high peak truss tent for Shout cleaning products and an arched tent created for Adidas. What is a gable tent? Well, a gable tent is a large standard frame with a different tent top design. It features a gable designed top as opposed to a pyramid tent style. It has an extruded triangle formation (see pictures above.) So, instead of four peak areas meeting in the center of a tent, you have two of them meeting while the other two are flat on each side. It is also commonly referred to as a barn or warehouse tent style. These are very popular for many sorts of events or even longterm installations ranging from concerts to weddings to even greenhouse tent installations. One other key feature that the gable tent offers is that it tends to come with a scalloped valance design but it can be manufactured with a regular rectangular design. As a frame tent manufacturer we have created many custom tents that no other company has ever made. One of these unique tent creations is actually a combination of two of our best selling products. We call if a tentflatable and it is an inflatable of your choosing on top of a frame tent. The tent style is generally a gable styled tent that we have modified to create a platform on the tent peak, where the inflatable will rest. This marketing product is so new that the full extent of possible designs has not been reached. We have created Christmas themed tentflatables with inflatable penguins and a tent with snowflakes printed on it. We have also made some other tents with an inflatable Santa Claus emerging from a chimney on top of a tent printed with holiday slogans on it. Of course, that's not all we have made since we have been making them for over 10 years now. One of our earliest adopters were car dealerships who needed marketing products for their lots. So we created a lot of car inflatables and placed them on top of car dealership marketing tents! If there is an inflatable that we have created and that you would like to see on a tent, let us know, we are sure we can combine them and make a great tent with an inflatable on it. Aside from the core tent designs that there we manufacture (mentioned above), we also create custom tents that are unique in shape, size and of course, graphics. This is one of the features that makes our company stand out amongst other tent manufacturers. Most tent rentals/manufacturers only offer plain tents with very little options for you to choose from. With a frame tent the options are unlimited! Think of the Burger King "have it your way" slogan. That's exactly what we do! Except make tents, not cheeseburgers. Since we are the manufacturer we can create a tent however you want it to be! If it needs to be big, small, or giant... we can make it! If you need to print a pattern on your tent or a picture, we can do that too! What about having to add a logo to your tent or some other form of custom graphics? We can do it. It's what we do, we specialize in manufacturing tents in any shape, size or print style! 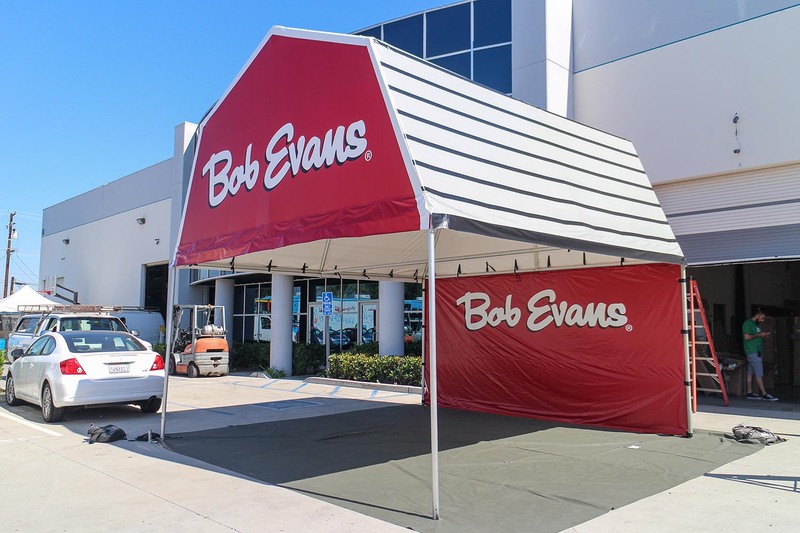 The example above is a tent that the Bob Evans Restaurant needed for their outdoor farm event. The thing is, they needed it to be shaped like their barn, so we printed the colors and patterns and shaped it like a barn and the tent turned out great! The examples above are a few of many other projects we have worked one. We have easily created over 20,000 tents during our 35+ years of business. This amount of experience is what allows us to continue to create beautiful tent structures. We have come to understand what it is a tent needs to be safe and sound. What is needs to be sturdy and what it needs to look as best as possible. We then pass all of this information on to you to help you decide the tent style, shape and size you need for your next event. We even provide free 3d mockups to show you what the final product will look like. This allows us to communicate better when creating an advertising/marketing product. All in all, we aim to create the best tents possible while providing you with a great experience during the whole process. 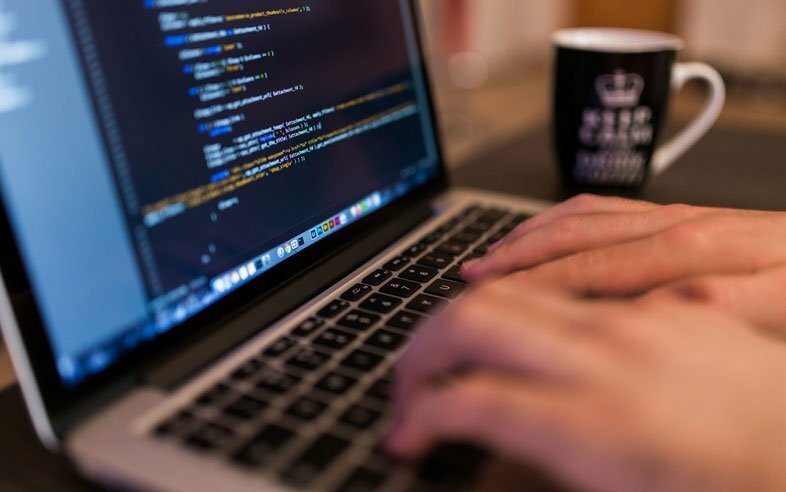 You can contact us on our "get a quote" page with any inquiries and we'll get back to you as soon as humanly possible. Our team members are always ready to help, just let us know what you have in mind so we can better help you. If you have specific questions or concerns, feel free to let us know and we'll help you out. We can suggest solutions to your tent needs and we will work with you to find the perfect project for your event.